Career Q&A: A Librarian's Real-Life, Practical Guide to Managing a Successful Career, By Susanne Markgren and Tiffany Eatman Allen | Information Today, Inc.
"From searching for that first library job to getting ready for retirement, Career Q&A addresses the key LIS career issues you're likely to face, and does so in Markgren and Allen's signature style: realistic, honest, funny, and smart. I can't wait to recommend this book to my students." Librarianship is an exciting and rewarding career choice that offers variety, diversity, flexibility, and room to grow. 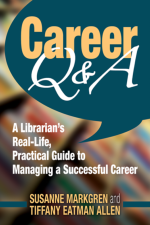 In Career Q&A, Susanne Markgren and Tiffany Eatman Allen examine events, transitions, struggles, and advances that encompass and define a librarian's career, answering a range of important questions library professionals face as they move through the various stages of their working lives. For more than 10 years, Markgren and Allen have collaborated on the popular advice column "Career Q&A with the Library Career People." Here, blending their own best advice with tips and ideas from a number of their savvy peers, they guide current and aspiring information professionals in their pursuit of satisfying careers.